I like Jon Acuff. I think he’s funny. I wish I had his sense of humor. He’s also the one that came up with one of my favorite Christian phrases: The Jesus Juke which I use often. I thoroughly enjoyed his Stuff Christians Like and thought it was hilarious, though a few people very close to me didn’t think so. But I tell them, often, that they don’t have a good sense of humor. He’s coming out with a new book in a couple of weeks called Start. And they were offering a whole bunch of things if you pre-ordered his book. As I was pre-ordering his book, I remembered he was offering something when he released his second book, Gazelles, Baby Steps and 37 Other Things Dave Ramsey Taught Me About Debt: he would take a look at your blog and give you tips, insights, and suggestions. Well, I did pre-order that book but he never took a gander at this blog. It was no biggie. I honestly had forgotten about it until I was preordering Start. So, I just tweeted him basically saying, “Hey you never reviewed my blog after I preordered Gazelles” thinking that he’d never see or get that tweet. 1. Be careful about the length of your posts. 5 years ago people would accept 800 word long posts but now with twitter and pinterest, the length needs to be shorter. Your last post was over 1,000 words. Shorten them. 3. Figure out a consistent posting schedule. I couldn’t figure out how often you post. 5. Help me as a reader know what topics you are going to focus on. Maybe make that clearer in your subhead. I already took care of #4 and #5. My subhead now reads “Thoughts on Life and Faith and everything in between, like Batman.” That’s a bit more clearer on what this blog is about than the previous one “Loving God and making my mistakes look gracious,” which the second part were lyrics from a Jason Mraz song. On the same line of thinking, I once thought preaching for 40-45 minutes was great. Gave me plenty of time to address everything I wanted to. Nowadays, I really enjoy preaching for 20-25 minutes. It makes preparation easier and I think it makes listening easier. I realized the extra 20 minutes in a 40 minute sermon were used for fillers, transitions, and/or various illustrations. I could still get the heart of the message out in 20-25 minutes without the extra stories. I think shorter posts will also help keep this blog updated in a consistent manner, which brings us to tip #3. I also don’t know my own posting schedule. I tried to aim for every Wednesday, but that doesn’t really work out for various reasons. I forget; I didn’t know how to end the post, so I store it as a draft; and other various reasons/excuses. I also aimed for two post a week, but that didn’t work out either. But I’m working on it. Having a consistent posting schedule, I believe, will help me stay on track, focused, and disciplined on something I really like doing. Anyway, I’m grateful for Jon’s tips (and still a bit apologetic for my tweet). This blog gives me joy and an outlet to share my thoughts (though at the end of the day, that’s a bit egotistical. But, so am I, I guess) and so I do want it to be the best that I can make it. 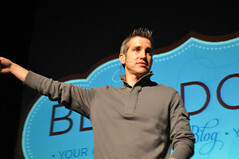 So thanks, Mr. Jon Acuff for your help. And as always, thanks for reading. Great advice from Acuff. I’m gonna review my blog with that same lens! uh… good luck with that…? Hey, if it’s intriguing, why fix it? i just realized this post was still long.